A 19-page Supreme Court judgment on October 11 could go a long way in clearing up the murk in property deals. The court has clarified that a general power of attorney, sale agreement or will transfer does not effectively transfer ownership of immovable property, and cannot be recognised as a sale. For changes to be made in municipal or revenue records, a registered sale deed is necessary. The judgment notes that such power-of-attorney transactions, which were only prevalent in Delhi and neighbouring states, are spreading to other states. One likely effect of the judgment is that buyers will exercise greater caution and prefer to deal directly with original landowners or, at least, insist on their presence while negotiating a deal. Another possible outcome is that states will reduce stamp duty, which would encourage people to register transactions and pay duty. Until now, buyers and sellers in large deals seldom negotiated face-to-face. Real estate developers typically negotiate through an agent who secures a general power of attorney from the original property owner, often by paying the owner a fraction of the market price. The process is often murky, with the agent 'persuading' the owner to part with his or her property through intimidation. Buyers are often aware of the agents' methods, but, as a leading developer admits, middlemen are useful because they are familiar with procedures and formalities. Property owners, by contrast, are generally not conversant with procedures, and they are often too many to deal with. "The ruling will not only help curb evasion of stamp duty, but also limit the use of black money and help establish clear titles to property," says Sachin Sandhir, Managing Director of RICS South Asia, a self-regulatory professional body for qualifications and standards in real estate. In a few states, including Delhi, Haryana and Uttar Pradesh, the authorities have made changes in municipal and revenue records on the basis of general power of attorney documents. 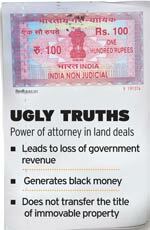 Typically, if a property dealer buys land in order to resell it, he saves on stamp duty by getting a power of attorney. Only the final buyer coughs up the money for stamp duty and the registration fee. The Supreme Court judgment is likely to change this practice. Vasudevan Madhu, former revenue secretary of Karnataka and now Managing Director of Provident Housing, says states should start collecting stamp duty only on the incremental value of the property. "The judgment will drive compliance, because it will put the fear of law into the mind of the buyer," he adds. Is the plan panel's criticism of the UID project under Nandan Nilekani justified?